How do I make empty or unused content areas, folders or items unavailable? If you have any empty/unused content areas, folders or items (e.g. irrelevant materials), then these should be hidden from students unil needed. Any empty content areas will automatically be hidden from students and will have the following image to the right of them denoting that they are not available to students. 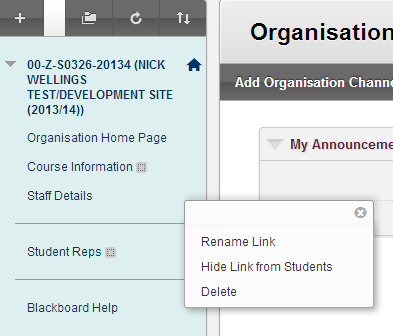 To hide an unwanted content area or menu item: click the chevron to the right of it and select Hide Link from Students. The menu will now be hidden from student view. You may have to hover your mouse on the content area or menu item name to see the chevron. The folder or item will be 'greyed out' and it will state 'Item is not available' below its name.